Welcome to the 'Your Royal' section of our online staff magazine 'Life at the Royal'. For archives relating to 2015, please click here or tab down for the current articles. 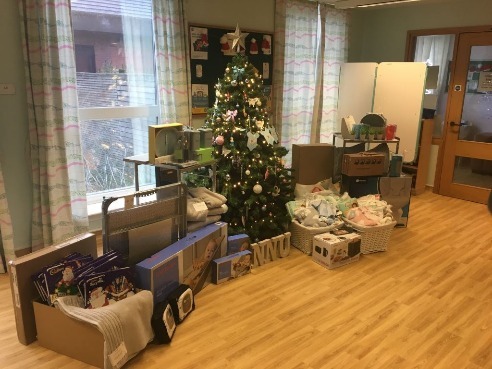 After hearing from a colleague whose daughter received care here four years ago, one Chesterfield company chose to support our Neo Natal Unit as part of their ‘Operation Christmas’ project. 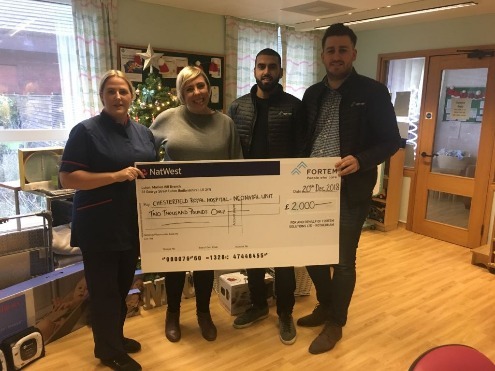 Fortem , a locally based building construction company , who work closely with Chesterfield Borough Council on housing projects , has now donated £2,000 to the unit , which has been spent on goods to revamp the parent’s room. Items included baby clothes, dinner sets, nappies, products and electronic goods – all designed to provide some home comforts whilst families remain close to their baby. Several selection boxes were also donated for the siblings of babies likely to be in hospital over the festive period. Cathy Jones, from Chesterfield Borough Council, whose daughter was cared for in our Neo Natal Unit after she was born, said:” It will be lovely for parents to have somewhere to eat proper meals rather than relying on café food, and somewhere that’s a break out space, not next to a cot, or in a blank room. “It will be a home from home – you do come in every day, and everything looks so clinical. All you hear is alarms, and all you see are wires. 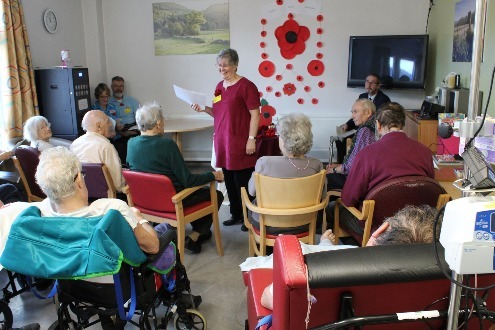 ​Our stroke patients were given the opportunity to honour the centenary of the end of the First World War and pay their respects to those who have given their lives during wartime. The Eastwood Ward team held a special service of remembrance on Monday 12th November with support from the volunteer chaplain service that included a number of readings of poems, letters written during the First World War and stories. The readings were punctuated by the playing of musical interludes that allowed our patients time to reflect and remember their own experiences, whether it be the First or Second World War, or people close to them who had given their lives during conflict. ​The stroke patients felt it was very important to them to do something to mark the occasion and the activities group helped them to make their own poppy displays. 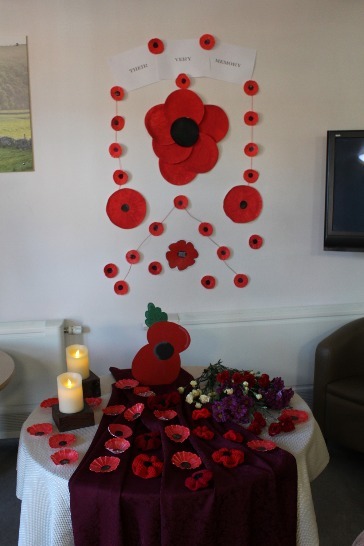 These were then used during the ceremony as a symbol of remembrance as one of the ward team collected them from patients during the ceremony to place on a display at the front of the room. ​Around 20 of our patients made it to the ward’s day room with help from our clinical and nursing teams. There was a lot of emotion in the room with some of the patients moved to tears during the service that clearly meant a lot to those able to join in. Our ward teams always aim to do their best to ensure our patients are involved in occasions such as this and the way the service was conducted, with practical involvement from our patients, gave the morning a great deal of poignancy. A big thank you to the volunteer chaplain service, including Alyse Ross who conducted the service alongside Tony Clarke, Carole Dysart, Colin Morgan and Kathleen Morgan. ​As the largest single employer in Chesterfield and with thousands of visitors every day, the Royal has quite a commitment when it comes to respecting the environment. Producing well over a thousand tonnes of waste per year, it might surprise you to know that the Royal is classed as a ‘Zero waste to landfill’ site. A great deal of work goes into the hospital’s environmental planning and much of the waste is diverted from landfill to energy recovery. It’s been achieved through a range of initiatives, Sally Ludditt is the Trust’s Waste and Environmental Advisor, she said: “We’re always looking at ways that we can recycle, for example we’ve got a machine that compacts the cardboard (left) and non-confidential paper waste. This has the dual benefit of reducing the amount of haulage and increases the rebate the hospital receives for cardboard and paper, enabling the non-confidential paper recycling to be introduced. We’ve now got more than 20 large, blue recycling wheelie bins across the site for staff to recycle their paper waste. ​“We’ve also introduced drinks can recycling in our food outlets through an onsite metals skip and recycled, allowing us to collect another rebate. Plastic bottle and glass recycling has also been introduced and we’re exploring ways to improve this. 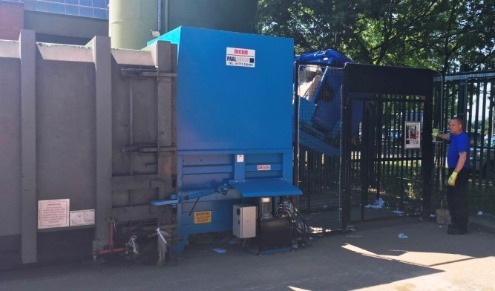 As well as improving the hospitals waste performance against the waste hierarchy, the hospital now has a more environmentally friendly way of moving the waste around the site. Instead of petrol vehicles, our porters now use an eco-friendly electric vehicle with a trailer. Efforts to find new ways of reducing our carbon footprint are always ongoing. ​If you would like to know more about the hospital’s waste management or if you would like to join the Trust’s recently formed “Staff Environment Group” please contact Sally Ludditt (sally.ludditt@nhs.net). Our Building Team has come up with a wonderful tribute to mark the centenary of the end of the first World War. They designed, built and installed this stunning and moving display, utilising crochet poppies and silhouette figures alongside with the emblem “Lest We Forget” in the hospital’s main entrance. The poppies were part of the appeal that went out across the whole of Chesterfield that saw a target of 15,000 overtaken and settle at an incredible 47,000. Rob Nash was the lead volunteer for the poppy cascades and used to work at the Royal. He got in touch with the team to see if it was something we could use as part of a display and they responded in spectacular fashion. 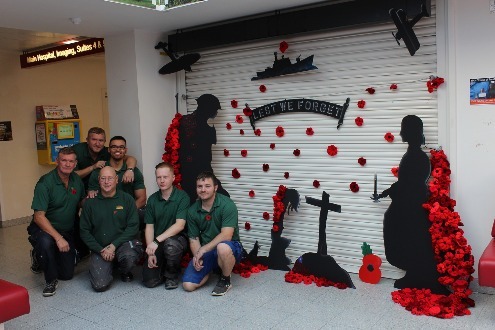 Casey Handby is part of the Building Team and instrumental in creating the display said: “I had some thoughts about how we could create some silhouette figures and creations that we felt would signify and recognise those who have died in war. We used MDF that was coloured black and touched up some of the edges to enhance the appearance and used that as the backdrop over which to hang and arrange the poppies. 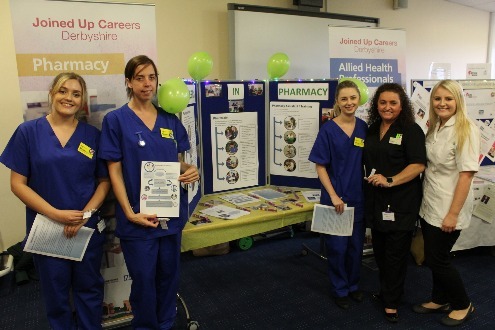 Health and Social Care Careers Fair - A Huge Success! ​More than 300 people turned up to a career fair that took place at the Royal to showcase the different careers available within the NHS and the wider health and social care sector on 16th October 2018. The Health and Social Care Careers Evening was aimed at anyone from the age of 14 to find out about the variety of professions and opportunities available within the sector, what is involved in the different roles and how to get on the path to the career that may be of interest. 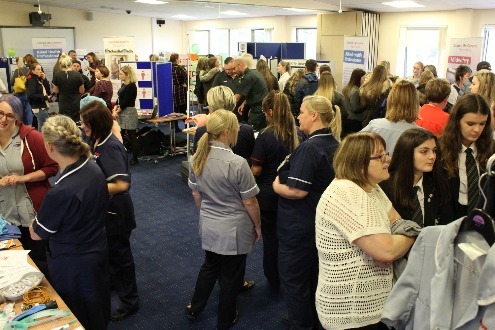 The Trust’s HR team organised the event in partnership with Joined Up Careers Derbyshire, Derbyshire Healthcare and Derbyshire Community Health Services with the event taking place at the hospital’s Education Centre. The intention was to inspire people who were just about to start their GCSEs and might be thinking about the different career opportunities available, as well as those looking to make a change of career and were perhaps looking at other options. ​Gill Stevens is the Royal’s Head of HR and worked on the event, she said: “It was a roaring success which reflected our intention that we didn’t want it to be like your traditional recruitment fair; it was more about having an opportunity to explore the fantastic possibilities available to anyone looking to take up a career within health and social care. We wanted to create a marketplace atmosphere and set up a number of stalls that featured nursing, midwifery, medical, general practice (GPs), theatres, physiotherapy, occupational therapy, speech and language therapy, dietetics, pharmacy, human resources, facilities services, radiotherapy, imaging, pathology, administration and the various apprentice roles. 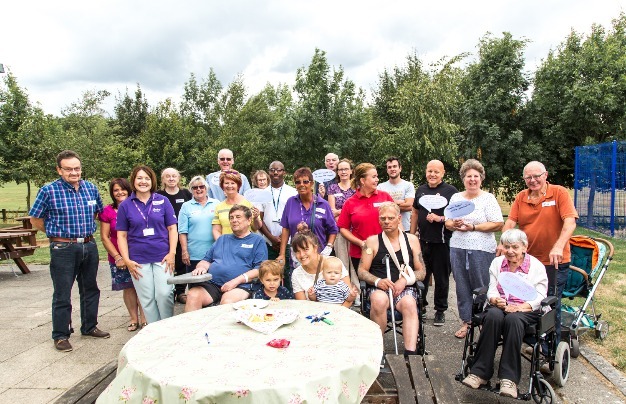 ​“There was something for everyone and allowed individuals of all ages, with all manner of different skills and from all backgrounds the chance to find out how they could make a difference in the health and social care field. We had representatives from universities and further education who were there to talk through the different qualifications and courses needed to follow a number of different career paths. There were also professionals who are currently following their own path to give advice about what is involved on a practical level in terms or work, education and skills required for a particular role. “The enthusiasm we saw from some of the people there was incredible and it was busy right from the beginning and the comments we got were really encouraging. I spoke to one lady who had seen the team from maternity because she wanted to find out more about midwifery. Having spoken to them and found out more about what’s involved she’s now determined to follow that road and has a clear idea of what she needs to do. That was the aim, to show people what they needed to do to follow their interest and hopefully we’ll see some of the came to the fair working for us in a few years’ time. ​“It all came about through the joint work we’re doing within the local Sustainable and Transformation Plan and we have planned the event to coincide with our ‘Work For Us’ Week. There are a number of employment fairs across the county but we wanted to hold our own to showcase the excellent work that’s done across the NHS, health and social care and how you can be part of its future. It’s given us the chance to hold demonstrations and clinical simulations that showcase the work the various teams do in a more practical way. 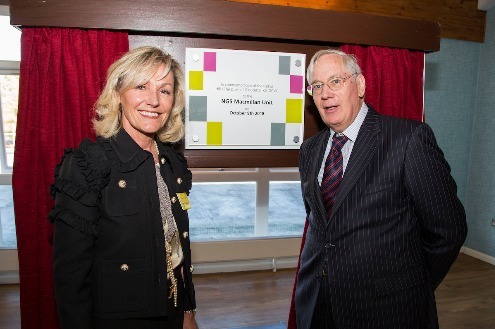 ​HRH The Duke of Gloucester has unveiled a plaque to officially open the NGS Macmillan Unit following a tour of the building at the Chesterfield Royal Hospital. The unit opened to patients in June 2017 following an 18 month building programme and a £2.5million fundraising campaign, including a phenomenal £1.5million donation from the National Garden Scheme (NGS), contributing to the overall £10million cost of the project. The Royal visit gave clinical teams, architects, designers, fundraisers and those involved in the project at all stages the chance to talk about their involvement and give their thoughts on the finished project and how the unit has improved cancer services for patients, their families and staff. Services that have been built into the unit include Haematology, Oncology, Acute Oncology, Chemotherapy, selected Medical Day Case activity, Palliative and Supportive Care. It is home to 21 treatment chairs, two treatment beds and three treatment rooms for chemotherapy patients compared to the eight chairs in the old Cavendish Suite which more than triples the capacity for treatment. There is also a Macmillan Information and Support Centre to help patients and their families through a diagnosis and treatment. 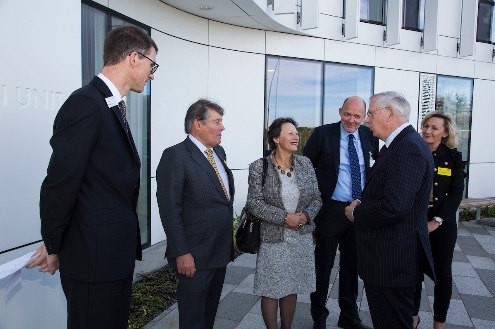 ​Carly Starkey is the matron for the chemotherapy service, she said: “It’s been such an honour to welcome His Royal Highness the Duke of Gloucester to our new unit and show him our treatment areas, demonstrating how it has benefitted our patients. Compared to the old unit, which could become very cramped very quickly in terms of space, this new facility is incredible for our patients and staff. There is so much natural light thanks to the huge window space and we’ve had a lot of positive comments from patients about the view across the countryside. Dr Roger Start is the Lead Cancer Clinician and led the project from the very beginning, he said: “We needed to address the growing demand for cancer services. Current statistics show that one in every two people born after 1960 will develop cancer within their lifetime which means that our chance of receiving a cancer diagnosis is increasing. The Royal visit included a tour of the unit’s clinical rooms, the chemotherapy treatment area, the Macmillan Information and Support Centre and reception. 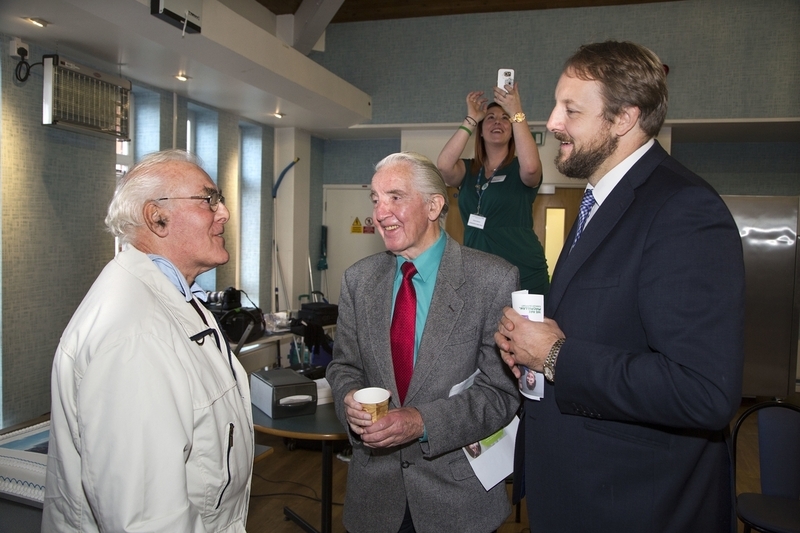 His Royal Highness spoke with staff who work in those areas and patients, hearing about the building of the unit, its design and how the wider community were involved throughout the project, not to mention the incredible efforts of those who raised money for the Macmillan campaign. To see a full gallery of pictures from the event, please click here. ​On Sunday 23rd September at 0830hrs the Trust took part in a multi-agency exercise to test the regional emergency response to a chemical incident. The Royal joined the East Midlands Ambulance Service, Derbyshire Fire and Rescue Service and Derbyshire Constabulary with support from St John Ambulance, Chesterfield FC and Chesterfield College to plan the event. It’s part of continued efforts to ensure that all services are prepared for a genuine emergency. The scenario that played out involved an acid attack carried out by a disgruntled groundsman at Chesterfield FC, which was where the exercise started. Emergency services were called to the scene, assessed casualties and brought them to the Royal’s Emergency Department where they were triaged and taken through decontamination. Laura Buxton is the hospital’s Lead Clinician for Major Incidents, she said: “It’s the first time for a very long while that we’ve been involved in such a practical exercise that sees all elements of an emergency response coming together. It was very exciting to take part and as a learning exercise was invaluable in preparing for a genuine incident. “In terms of planning for this, we were all aware of it in early Summer and have been preparing thoroughly which allowed us the time to take stock of our own responsibilities. 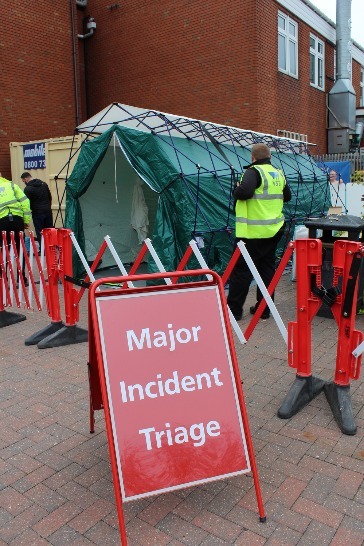 The Novichok incident in Salisbury acted as a catalyst for reinforcing major incident responses nationwide. We knew we had some work to do locally to ensure we were adequately prepared as we’ve had our own issues to contend with as a result of the recent ED development, for example our decontamination tent was in temporary storage and the geography of the area outside ED has changed so it’s forced us to rethink our approach. 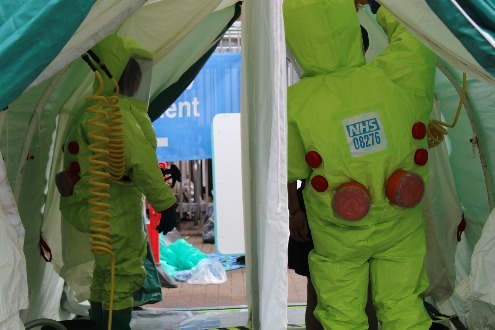 ​“Pleasingly, from the arrival of the first self-presenter to ED reception and then getting the declaration of a major incident and notification that patients were arriving, our mass decontamination tent was up within twelve minutes. 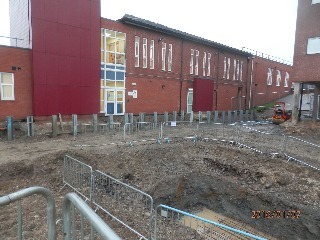 We would usually put the tent to the far left outside ED but there is still building work taking place as part of the MRI development so it had to go outside the front of ED. This was good for us because we now know that we can make both locations work, giving us two options in terms of where we can decontaminate. ​“We were also keen to test our IT capabilities so used this as an opportunity to enter some of the major incident patients on our EDIS system. Previously we would have done this on paper but we need to move with the times so made the decision to use the live version of the system as we would if it were a genuine incident. This worked very well and served as a great piece of learning for us. “In terms of capacity we managed to fully decontaminate 16 casualties within 90 minutes of notification which is tremendous. We had previously estimated that we could decontaminate between 10 and 12 casualties before requiring additional support from Derbyshire Fire and Rescue Service (DFRS). To know that we could comfortably decontaminate in excess of this estimate was really reassuring. Derbyshire Fire and Rescue Service have a bigger tent and capacity to decontaminate up to 100 patients in an hour but they estimate that it would take approx. 2hrs to arrive on site and get set up to support us. Testing the ED’s capabilities to independently decontaminate multiple casualties ourselves was a crucial objective for this exercise, and I’m very proud to say we more than achieved this! ​“Also on the positive side, we did an impromptu communication cascade test using WhatsApp and found that we could feasibly bring in an additional 12 members of the senior medical team to help in ED within the hour. That’s not bad on a Sunday morning and it’s encouraging to know that we can rally the troops if needed. 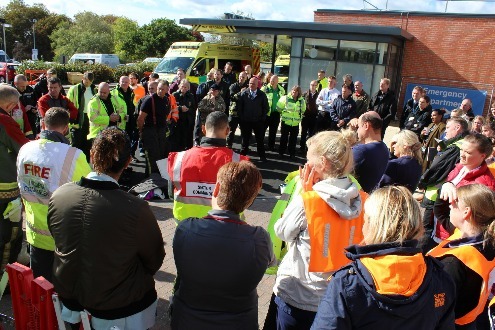 “Inevitably there are some lessons to be learnt from Sunday’s exercise: Some of this can be attributed to the fact that it was an exercise and not a genuine incident, for example there was some confusion about whether a major incident was officially declared or not as EMAS did not use the standard pathway to communicate this with Chesterfield Royal. Additionally, we have identified some elements of our Major Incident Plan that need updating; we need more receptionist training and we need to make improvements in terms of communication between what’s happening at the scene and what’s coming to us at the Royal. Having identified the elements that haven’t quite gone according to plan, we are better able to address them so that if and when a real incident happens, we are ready. For a complete set of images from the day, we have set up a gallery that acts as a storyboard of what happened throughout the event,,,you can view the gallery by clicking here. Wii just wanted to say 'Thank You'! 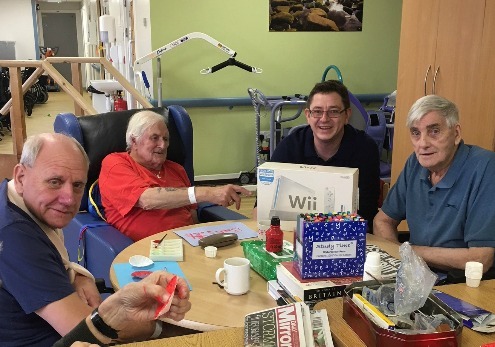 ​A family has donated a Nintendo Wii to the Trust’s stroke services in a wonderful gesture to recognise the care he received in being nursed back to health. Pat Gilbane was admitted to Eastwood after suffering a stroke, receiving extensive therapy on the adjoining Speedwell Rehabilitation Unit. Thanks to the care he received and the work he put into his own rehabilitation he was discharged and the family wanted to give something back. The rehabilitation unit is multi-disciplinary with a number of therapy teams, including speech and language, physio and occupational therapy work with our stroke patients to give them the help they need, depending on how the stroke has affected them. They use a range of tools, including walking aids, exercise bars and a fully equipped kitchen to replicate aspects of home life that gives our therapists a basis by which to assess whether a patient is ready for discharge home. ​The Wii has been used before as part of patient therapy thanks to the way it replicates hand and step movements, improving motor skills and hand-eye coordination. This donation will be used for current and future patients to help them in their own rehabilitation. Pat, Hilary, Christopher, Fran and Rich Gilbane left a message of thanks with the Wii that said: “To all of the team on Eastwood Ward and Speedwell Rehabilitation Unit, we would like to say a big ‘thank you’ for all of the help you gave our father, Pat. On behalf of all of the patients on Eastwood Ward, Speedwell Rehabilitation Unit and those who work there, thank you very much to the Gilbane family and we wish Pat a continued recovery. ​Stroke patients old and new took the opportunity to enjoy some time away from the ward and soak up some sunshine at the ‘Stroke Café’. The café takes place on the second Wednesday of every month in or outside the Education Centre and anybody who has suffered a stroke, or been affected by a loved one who has had a stroke is welcome to come along and join in. Lindsay Millward is the Stroke Unit’s Activities Co-Ordinator, she said: “We hold this in partnership with the Stroke Association and it’s to allow our current patients to speak to those who are living with the effects of stroke. They can talk about shared experiences and find out that, though recovery can be a long road, there is light at the end of the tunnel in terms of leading as close to a normal life as possible. Each patient and their families were encouraged to write on a speech bubble to express how they were feeling through the photos. If you would like to view more of the pictures then we have created a gallery from the day which you can see by clicking here. ​The Royal’s Imaging department has seen a working relationship with Chesterfield Art College come to fruition with colourful results. The team approached the college to see if some of the art students would like to create some pieces of work to brighten up the waiting areas, encourage discussion and give the patients a distraction to take their minds off their forthcoming procedure. Steven Cullen is the Clinical Specialist Radiographer, he said: “It started in 2017 after our CT scanning area was refitted and expanded. 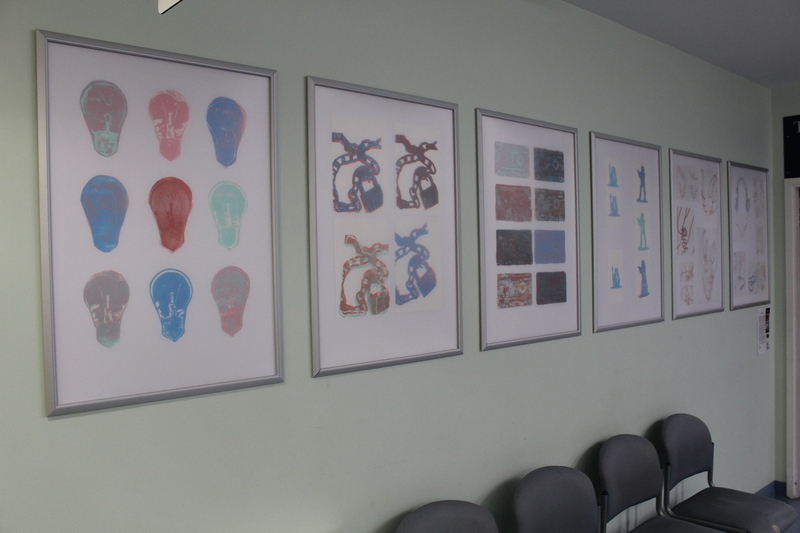 It resulted in a new wall that was completely bare and we didn’t want to cover it with posters and patient information so we looked into the idea of incorporating some sort of display onto the wall. ​Steve Penney said: “The broad title of ‘X-Ray’ was taken, however, this was just a starting point where ideas, research and interpretation became individual. A diverse range of ideas were investigated, drawing from many different sources, focussing on such concepts and qualities as transparency, internal, layering and translucent colours. The 16 and 17 year olds came up with a total of 11 pieces, some of which were sculpted pieces that had to be photographed, that they showcased at a two week exhibition within the College as a final end of year piece. After that they were received by Steven and Louise, ready to be put up in the main x-ray reception area. Steven added: “We’re very impressed with the finished pieces as we weren’t quite sure what we’d get. All of the pieces are very different with some focussing on the colours of ultrasound, others examining the idea of something hidden being revealed with others open to interpretation. What we’ve already seen is that they’ve sparked debate and conversation between people waiting and our own colleagues so for me, it’s a success. Get Your Apples and Pears!!! Walking into the Royal’s main entrance on Tuesdays and Fridays, you could be forgiven for thinking that you’re at Chesterfield market! As part of efforts to encourage healthy eating amongst our colleagues and visitors, we’ve got a fruit and veg stall outside the main entrance, selling fresh fruit and vegetables that come straight from local wholesalers and farmers markets. It is part of a collaborative idea from our Health and Wellbeing Committee and the Listening into Action programme, following suggestions from staff that if they were presented with a healthy alternative for snacks and lunch, it might encourage them to leave the crisps and sweets behind. ​Kim Beevers is the Trust’s Head of Retail, she said: “At first we looked at setting up our own stall but we couldn’t get the prices that we wanted so then we looked at the possibility of bringing someone in who already had that arrangement in place with wholesalers. 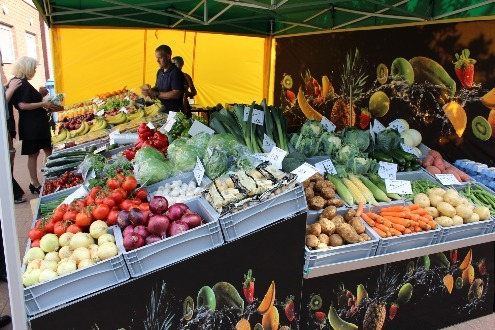 We eventually made contact with Hasland Fruit and Flowers who showed interest in setting up a stall to sell fruit and veg at market stall prices. 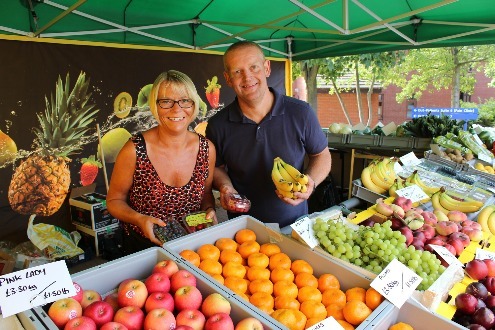 Simon Richford from Hasland Fruit and Flowers added: “This prolonged summer has lent itself to outdoor markets but we wanted to make sure we got the right plans in place before starting this up and it’s gone down very well so far. People seem to like the fresh food, whether it’s for lunch, a snack or even for a tea time salad. The stall will be outside the Royal’s main entrance every Tuesday and Friday from around 7.30m until mid-afternoon. ​The Royal has unveiled the latest part of our efforts to create a calm and relaxing environment for patients receiving cancer treatment at the NGS Macmillan Unit and their families. The unit has now been open to patients for a little over a year, bringing together many of the Royal’s cancer outpatient services in one, state of the art building. The project was supported by a £2.5million fundraising campaign in partnership with Macmillan Cancer Support that helped to turn what would have been an ordinary building into an extraordinary one that was created with the input of architects, staff at the Royal and patients who used the facility. But Macmillan’s generosity didn’t end there. 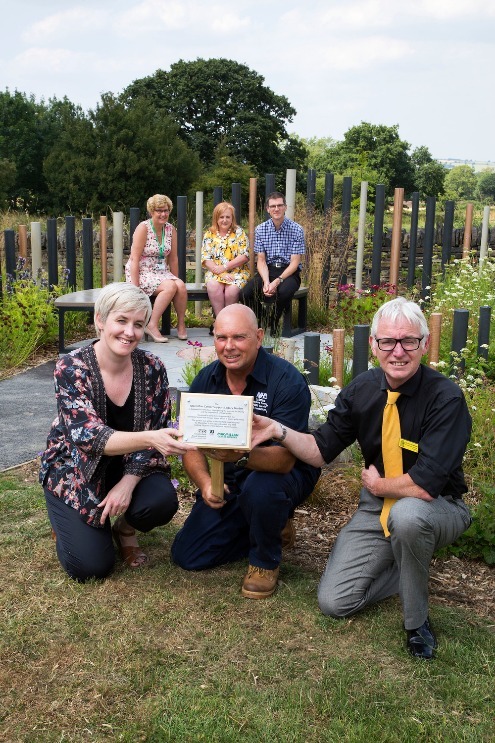 A legacy garden, called ‘The Garden of Reflection that was designed by Lara Behr, won a gold medal at the RHS Flower Show at Tatton Park and was gifted to the hospital by Macmillan in 2017. Lara worked very closely with Derbyshire Community Health Service Groundsman David Sanderson to recreate the garden as closely as possible outside the NGS Macmillan Unit for patients and visitors to escape the hospital setting and enjoy the hospital’s natural surroundings. ​Roger Start is the Trust’s Lead Cancer Clinician and oversaw the building of the unit, he said: “It’s a wonderful gesture from Macmillan and highlights that our partnership didn’t end with the fundraising campaign. The fabulous NGS Macmillan Unit allows us to care for local cancer patients and their loved-ones, both physically and emotionally, in a purpose-built environment that is ready for the future. It was always an ambition of mine to develop outside resources so to be given this incredible garden was amazing. Gardens can be really beneficial to health and well-being, particularly for those with cancer, and this gives our patients, visitors and staff a place to enjoy the fresh air, peace and reflection away from the clinical environment. 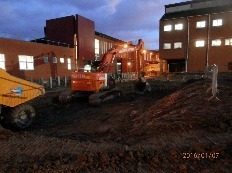 We are working hard to improve our open spaces and make them more accessible to both patients and staff. The Garden of Reflection was designed by Lara Behr and highlights the work of the charity and the importance of legacy gifts. Timber poles of varying sizes represent the work of Macmillan that has been made possible by donations, both and large and small, particularly significant for the NGS Macmillan Unit and the contribution made by so many fundraisers across the local community and the National Garden Scheme (NGS). Picture above, front (left to right) – Lara Behr (Garden Designer), David Sanderson (Groundsman), Vernon Sanderson (Assistant County Organiser for NGS Derbyshire). ​With the Trust’s Listening into Action programme just over a year old, a celebration event was held to showcase some of the great work being done across the hospital. It’s the second such event, known as ‘Pass It On’, to highlight some of the ideas and innovations that have improved the quality and safety of our patient care, changed our services and systems and made the places we work in better for colleagues. 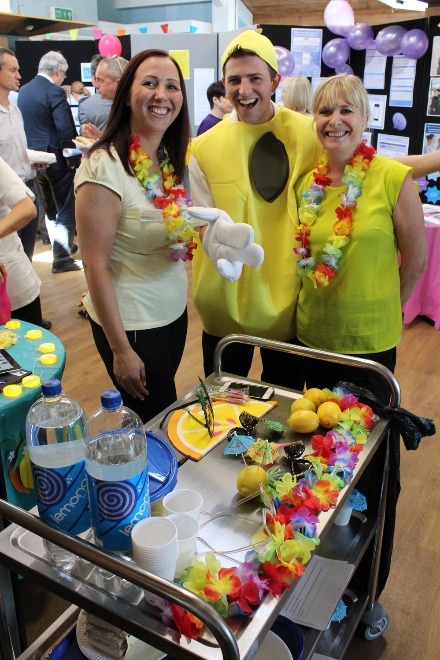 A number of clinical teams created stalls and displays to explain their ideas, detailing what needed changing, how they affected change and how it benefitted our patients and colleagues. More than 600 people came to enjoy the fun and find out more. A lot of the stalls were interactive which drew the crowds and helped them to understand what they’d done. This included a ‘pin the wound on the body’ game from the Tissue Viability team, a challenge to find the orange ‘needle’ in a box full of straw against the clock and therapists demonstrated the new wheelchairs in a busy environment. One highlight featured a Speech & Language Therapist dressed up as a lemon (see left). Their project involved incorporating a cough reflex test using citric acid in their swallow assessments, for patients who have had a stroke. The crowds were also entertained and stunned by a pair of magicians preforming exciting card tricks that contributed to the atmosphere. A plate spinner added to the fun, getting everybody involved by handing out a few plastic plates, giving our colleagues the chance to try and keep the plate spinning on the stick. A caricaturist also made quite an impression with some incredibly precise drawings. And there was no shortage of refreshments with colleagues treated to a total of 550 pork sandwiches, a popcorn stand and melted chocolate covered fruit, doughnuts and marshmallows which were enjoyed by all. It was an inspiring event and the atmosphere was buzzing with plenty of enthusiasm so a big thank you also to those who created and manned the stalls, helped out with refreshments and assisted in putting up and taking down the display boards. It was a resounding success. We have created a gallery to give you more of an idea of what happened at the event, what was included in the stalls and how the event was received by those who attended. Click here to view. ​The Royal’s Stroke Unit has teamed up with the Stroke Association in Chesterfield to raise money and help their patients at the same time. A cake sale was the main event at a tea and coffee morning on the Speedwell Therapy Suite where former patients of the unit came to talk to current patients, offering support and advice about their recovery and living with the after effects of a stroke. It’s part of continued efforts by the unit and the rehabilitation team to set up a support network of support that includes former patients and carers. Lindsay Millward is the Activities Co-Ordinator on the unit, she said: “A stroke can be a life changing experience that’s difficult to come to terms with, especially in the early days when you’re in hospital. By introducing them to former patients who can talk to them about their experience, it can offer a different perspective and show that it is possible to retain independence and there is a network of support out there. ​The money raised from the cakes, all baked by the patients, families and volunteers, will be split between the Stroke Association and the Stroke Unit. The money will be spent on improving the Stroke Unit Garden and making it ready for the Summer. If you are living with the effects of stroke then the Chesterfield Stroke Group holds a session to give advice and support on the first Friday of every month. They take place at St Thomas’ Centre on Chatsworth Road in Chesterfield between 2pm and 4pm. The Royal also hosts a ‘Stroke Café’ on the second Wednesday of every month in the Trust’s Education Centre between 10am and 11.30am. Patients from the ward meet with former patients to offer support and advice, ring the ward on 01246 512344 for more information. The benefits of a cuppa! 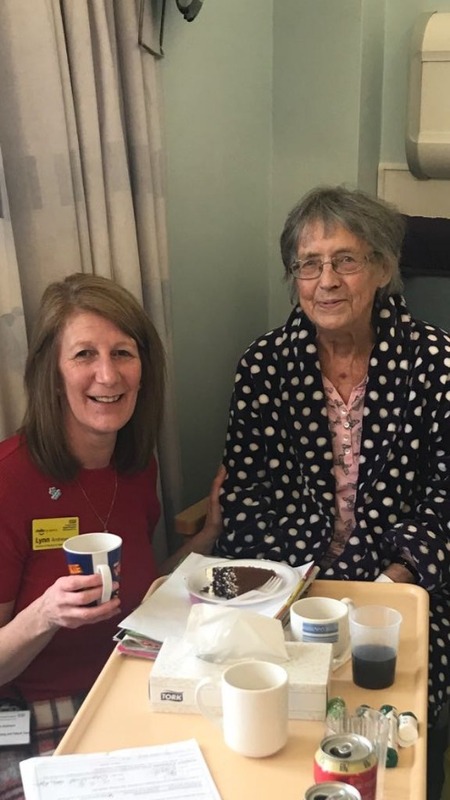 ​The Chesterfield Royal Hospital has marked National Nutrition and Hydration Week by taking part in a Worldwide Afternoon Tea Party, involving all of its inpatients. The Trust’s catering team organised for tea and cakes to be delivered to its wards between 3pm and 4pm on Wednesday 14th March to encourage its patients and their visitors to understand how important nutrition and hydration is to a person’s recovery. Our Director of Nursing and Patient Care Lynn Andrews (picture left) was one of those who went onto the wards to help serve the tea and cake. Melanie Coy is the Royal’s Head of Dietetics, she said: “We hear a lot about the need for a healthy diet and combating obesity but, for many of our inpatients, it’s more a case of getting the right diet for their condition and, in most cases, this involves trying to help them to eat more to maintain or improve their nutritional status. These patients need food that’s high in calories and protein, so snacks between meals helps with this”. It’s also about social interaction and thinking about what we do when we eat and drink. If you think of the get togethers that you might have at home then what springs to mind are dinner parties, barbecues, Christmas and family gatherings. They always involve food and drink and it makes you feel good, helps you engage and communicate with other people and even encourages you to eat and drink more. That’s the other side of what we’re trying to achieve with this, having a chat with someone and lifting the spirits. There are psychological benefits to eating and drinking that can be just as powerful as the physical effects when it comes to recovery and getting in the right frame of mind”. Where they could, staff were encouraged to sit and talk with their patients to reinforce the importance of the social interactions associated with taking a break and having something to eat. Every patient in the hospital was given the opportunity to take part with a piece of gateau or sponge and there were other treats for those on special diets. Melanie added: “We’ve done this before and the response was great to see. You can visibly see the lift that it gives as everyone stops for a moment and the atmosphere seems to become a little less clinical”. ​The Trust has joined colleagues from Chesterfield Borough Council to mark the death of a special nurse. 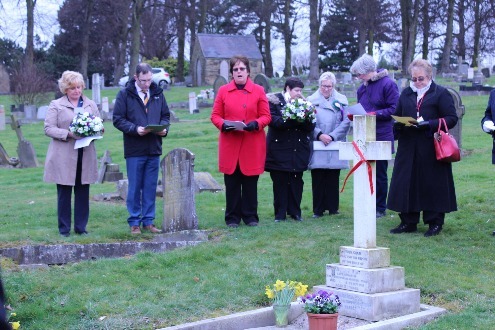 Coming less than a week after International Women’s Day, a service has been held at Spital Cemetery to honour the 100th year since the death of Anne Veronica Fletcher, who was a Staff Nurse from Chesterfield who died in during the First World War 100 years ago. She had apparently served at East Leeds War Hospital between 1915 and 1917 before dying at home from Tuberculosis of the Lungs. Her death, at the age of just 27 years, has been recognised by the Commonwealth War Graves Commission and the Royal was joined by representatives from Chesterfield Borough Council, the Royal British Legion and UNISON to pay their respects. ​Bridget O’Hagan (pictured above, far left), the Royal’s Deputy Director of Nursing and Patient Care, laid a wreath at the memorial headstone, she said: “I’m always intrigued by the history of nursing and would love to find out more about Veronica, the name by which we were told she liked to be known, and the type of work she carried out during the war years and before. The ceremony, led by Councillor Tricia Gilby, took place overlooking the memorial where the wreaths were laid along with crosses as a mark of respect and recognition. A number of poems and readings were performed before a rendition of ‘The Last Post’ was played to honour the role Veronica played in the war effort, followed by a two minute’s silence and Councillor Gilby’s response “When you go home tell them of us and say, for your tomorrow we gave our today”. The ceremony took place at 2pm in Spital Cemetery on Wednesday 14th March, click here to see a picture gallery of the service. ​An appeal, aimed at reducing the anxiety for children visiting Emergency Departments, has delivered a landmark teddy bear to the Chesterfield Royal Hospital. 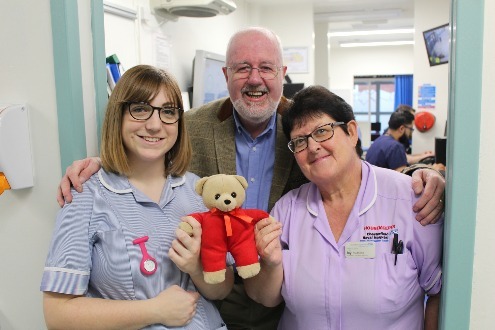 The bear was amongst the latest batch, delivered to the Royal’s Emergency Department by the Chesterfield Freemasons, marking the 50,000th bear delivered in Derbyshire from the TLC Appeal. The Teddies for Loving Care, TLC for short, is designed to help put youngsters at ease by allowing nurses to simulate the care they are about to give to the bear, for example bandaging or injection, thus reassuring the youngster that there is nothing to be afraid of. They are then given the bear to cuddle and play with throughout their treatment and take home upon discharge. ​Joy Maddison (pictured above, right) is the ED Housekeeper and takes delivery of the cuddly toys, she said: “It works wonders and the parents really appreciate the gesture of their child being given something that takes their mind off their treatment. The idea came from a Freemason in Essex whose wife needed emergency treatment following an allergic reaction that left her unable to breathe properly. They found it a terrifying experience and got them thinking about how much more traumatic it would be for a child and what could be done to help make that experience better. They discussed this with their Masonic Lodge and the TLC appeal was born. 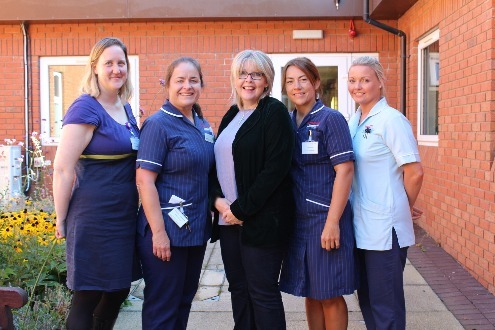 ​A former patient of the Breast Care Unit has been telling us her story to highlight the tremendous work the team has done in taking care of her. 57 year old Helen Walker has recently been given the all clear after she was diagnosed with Breast Cancer, news that came as a real shock to her as there was no detectable lump. “It all came about after I went for one of my scheduled, regular appointments for a routine Mammogram. It was something I’d done a couple of times before and there was no particular reason for me to be concerned, but this time the letter came back to me to say that there was evidence of calcification and that I needed to get in touch with them. “Obviously I was concerned and surprised as I do examine myself and I had not discovered any lump, so I got in touch and arranged to have a biopsy. When I got the results back they found a very small tumour, no bigger than eight millimetres that turned out to be the very early signs of cancer. ​“I saw a Consultant straight after my biopsy and had further scans on the same day. I was in a bit of a daze but they never left me alone at the beginning and they took their time with me, explaining what was going to happen and reassuring me that the detection was very early, answering all of my questions. I told them that I wanted to be positive, that I am a Christian and belive in the power of prayer; they completely respected that. “I was booked in for my operation on the same day which was very reassuring as I could see that things were moving and that everything was being done to make sure I was treated as soon as possible. It was such a big help to me mentally to know that I wasn’t waiting; your mind runs away with you at times but I always felt that I was in good hands. I did have three operations after the first operation they found a two millimetre pre-cancer cell which was removed, I also had two lymph nodes removed on the first operation which was clear, the third operation was clear. “I was blessed as I got two cancellations which meant that my operation was sooner than expected. The consultants came to speak to me before my op, as well as the anaesthetist to explain what was going to happen to me, why and how they were going to look after me. I really felt like I was treated as an individual rather than just another patient or a number. “Recovery was also very frightening and I needed another two operations that were carried out by the same consultant which was brilliant for me as, once again, it felt reassuring and familiar. All surgical procedures can be daunting so any little thing that can be done to remove that fear of the unknown is a blessing. I saw Dr Massey, who is the most down to earth person, on a regular basis regarding my results and treatment and, along with Dr Ismay and Dr Hollywood, they were a brilliant team. “It’s been a very difficult time for me, made so much more bearable by the entire team who showed me the kind of care and consideration that I would give to my own relatives. Everything, from the nurses who carried out that initial Mammogram, to the ladies in the Breast Care Unit who did everything they could to look after me when I was given the bad news, comforting, reassuring me, listening to my concerns and being a friend as well as healthcare professionals. “I then went on to have 15 sessions of Radium at Weston Park Sheffield. Again I cannot fault them the consultants were very kind very informative bring able to ask questions and I wanted to keep positive which I said to them even in a difficult situation all the staff all the way through my treatment tried to speak to me in a positive way which I think is very important. ​The Royal’s Very Own Santa Claus! ​​No Christmas at Chesterfield Royal Hospital would be complete without the visit of Dennis Widdowson. 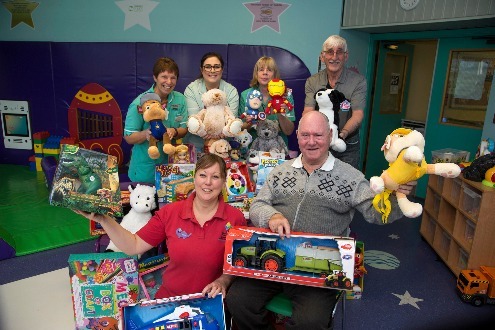 Delivering thousands of toys, games and books over the past four decades, Dennis’ incredible generosity has regularly blown away staff on the Trust’s children’s ward. Every year, for the past 35 years, he has crammed his car full of goodies to give to children staying at the Royal on Nightingale over Christmas, making the short journey from Shirebrook. After starting to donate toys through a tournament at his golf club, Dennis (bottom right) and his wife Mary decided to go on their own and donate the gifts themselves. ​Sadly, Mary passed away last year and there were whispers he would be donating fewer toys and making a cash donation instead. However, we shouldn’t have doubted him for a second! “Mary told me to carry it on, and I have,” Dennis explained. Helped by his friend Terry (top right), the pair arrived at The Den with two cars packed full of dozens of bags, bursting with every kind of toy you can imagine – with plenty of wrapping paper too. Dennis told us he starts buying gifts right at the start of the year and keeps topping his haul up until December. Each present is then wrapped by the staff on Nightingale and gifted to the children on the ward on Christmas Eve and Christmas Day, so no child goes without a present. From everybody at the Trust, we’d like to express our thanks to Dennis and wish him a very merry Christmas! ​Two of our Junior Doctors have won first prize at a Quality Improvement Clinic for a project that has improved the collection of bloods on wards. 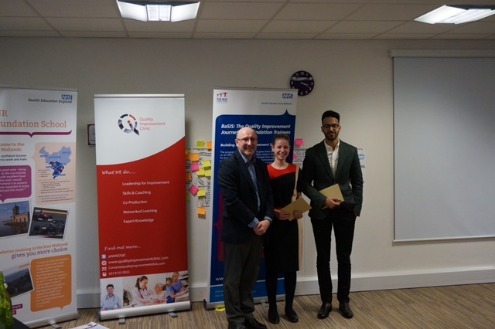 Nyssa Comber and Sagheer Hanif began their improvement project over concerns that delayed blood tests could be affecting patient discharge dates so set about trying to find out how this could be improved. ​Sagheer said: “The first thing we did was to introduce a box within which the phlebotomists could put the forms corresponding to the patients who hadn’t had their bloods taken. The thinking behind this was that the box could be checked so doctors would know which patients were missing bloods and didn’t waste time chasing results. It didn’t work as doctors still weren’t aware as the boxes were moved, ignored or weren’t visible enough. “This meant we needed something else,” added Nyssa, “so we introduced stickers that said ‘missed bloods’. The idea was that phlebotomists would put a sticker on the bedside of any patient whose bloods they missed. This was a resounding failure as doctors would sometimes see the patient before the phlebotomist so the stickers went unseen. We also tried making use of the whiteboards for phlebotomists to make notes but it would invariably get wiped off or not noticed so we looked at a fifth option. 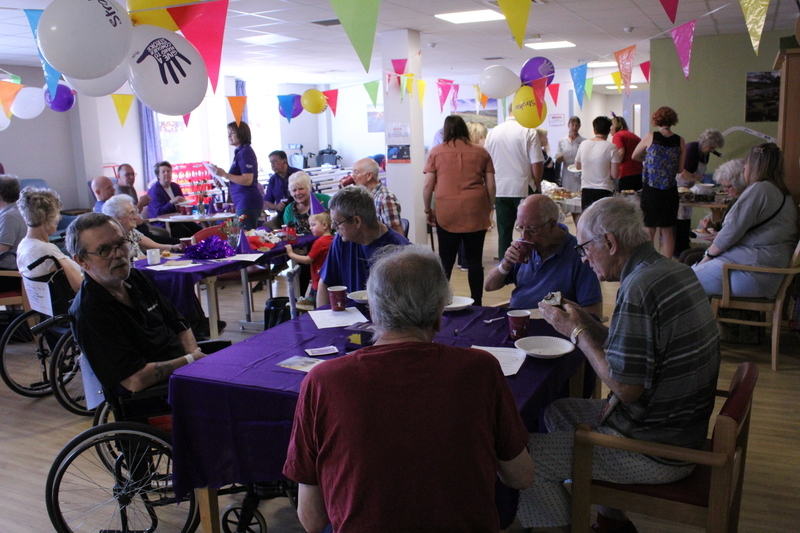 On 4th July 2017 we held the biggest tea party ever held at the Trust to congratulate our colleagues on the hard work they put in to achieve a CQC rating of 'Good'. It follows the 2015 inspection which returned a rating of 'Requires Improvement' and prompted the Trust to create and implement an improvement plan which has been followed through impeccably and resulted in our new rating earlier this year. It's the first step towards our aim of becoming 'Outstanding' and recognises the hard work put in from all corners of the hospital from nursing and clinical teams to administration and domestic. To mark this achievement the Trust decided to recognise that effort and hard work by treating our colleagues to a slice of cake, or a healthy alternative such as fruit or yoghurt. 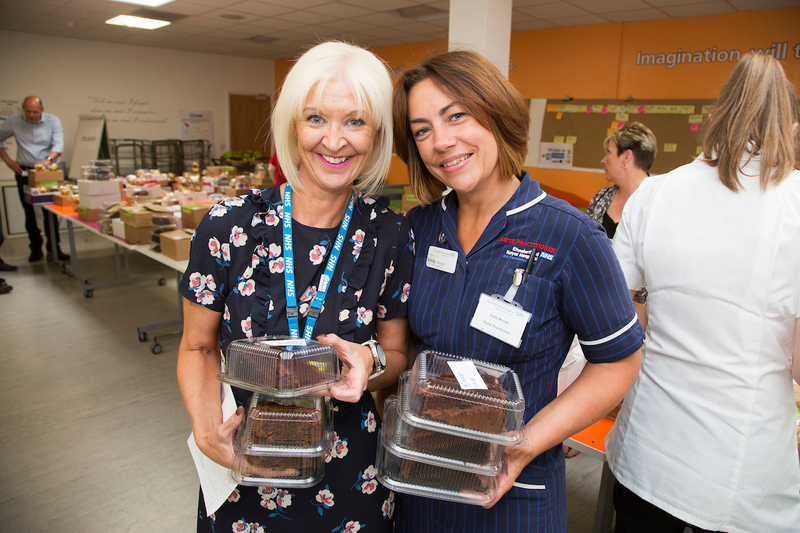 Time was set aside between 3pm and 5pm when cake was delivered to wards by members of the executive team and senior leaders or collected by Patient Services Assistants on their way to their shifts. Outpatient suites, offices and other departments collected theirs and there was also cake and refreshments available in the main entrance for those passing through. Some wards decorated nursing stations with bunting to get into the spirit of things and involved patients in the fun. Those who visited the main entrance were treated to a performance by our newly formed hospital choir and a party atmosphere that was enjoyed by all. Chief Executive Simon Morritt was among those who took cake to the wards, he said: "There are thousands of individuals working here to provide high-quality patient care and services. Everyone of them plays a vital role as part of a 3,700 strong team. This rating is their success and we are absolutely delighted for them. Through their commitment and support they've taken positive action to make a difference - and have proved our hospital deserves to be 'Good'. I congratulate and thank all of them for the contribution they have made to this result." You can see some of the photographs from the day in the slide show above, to view the full gallery click here. ​Small things can make a big difference and that’s the approach the Chesterfield Royal Hospital is adopting with waste paper. New, plastic waste bins are being distributed across the Trust specifically for non-confidential waste paper and cardboard to help reduce the amount of waste sent to energy recovery and increase the amount of paper that can be recycled. The bins were introduced at a stall in the main entrance in partnership with waste contractors Veolia and Russell Richardson, where members of staff were also encouraged to make a pledge about what changes they would make to improve the environment. Sally Ludditt is the Royal’s Waste and Environmental Advisor, she said: “We’ve made a commitment to reduce our carbon footprint and this is another step to being able to prove that we recycle more of the materials that we’re able to. A number of staff made pledges to do their bit to improve the environment which included walking or cycling to work a certain number of times a week instead of driving, attempting to go paper free, car sharing with colleagues. ​There's a change of venue for this year’s annual service of remembrance for parents who have lost their children. Following last year’s severe weather, the decision has been taken to move the service from car park 5 to the Barcelona Suite at the Casa Hotel. The service, organised and led by the Chesterfield Birth Centre co-ordinators, paediatrics, the neonatal unit, women’s health unit and the hospital chaplain, will remain unchanged. It’s all part of the ongoing support for families who have lost babies and children through miscarriage, stillbirth, illness or accident. The service has been running each year since the early 90s and always takes place on the Sunday after the Easter weekend, falling this year on Sunday April 23rd. Linda Gustard is the Divisional Head of Midwifery, she said: “This event has grown in popularity over the years and is a very important part of the grieving process, allowing those parents who attend each year to take great comfort in being with others who have shared a similar experience. It is tremendously well attended and we see a lot of familiar faces each year as well as some new ones. The afternoon will include readings, songs and the recital of the names of their baby or child to enable parents to light a candle if they wish and each family will be able to write a message in the book of remembrance. The service starts at 3pm in the Barcelona Suite at Casa Hotel in Chesterfield and there will be plenty of parking for those coming by car. It is open to everyone, allowing families and friends to come along. The Chesterfield FC squad visited our youngsters and staff on Nightingale ward and The Den to hand out goody bags, chat to the patients and sign autographs. It's part of the Trust's annual Christmas preparations and it's always good to see the team come down en masse to provide a boost to our youngest patients and help take their minds off what it is that's brought them here. Jenny Reaney is the Play Team Leader, she said: "They come down every year and it's always a thrill for the youngsters, even those who don't really follow football have a great time talking to them and, of course, seeing Chester the Field Mouse! "We do our best to give the children something special in the run up to Christmas. You never choose to be in hospital but for younger patients they'd rather be at home or with their friends, joining in with the festivities, so to be at the centre of a special visit such as this one is a real tonic." A big thank you to Chesterfield FC and the very best of luck for the rest of the season, you can see a slideshow of their visit to the left. ​The Royal’s Microbiology and Blood Science teams have been working together to develop a new process which hastens the diagnosis of Sepsis. 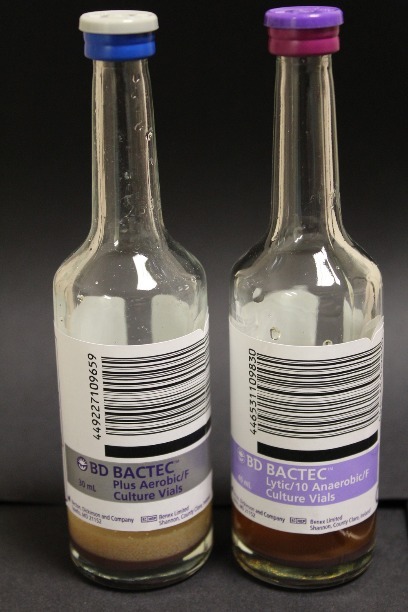 A new system of taking and testing Blood Cultures has led to them being tested sooner than when using the previous system. Time is a major factor in successful Blood Culture testing with guidelines suggesting that they be analysed within four hours of being taken and statistics suggesting that for every hour that a Sepsis remains undetected the risk of death increases by 7%..
With the Microbiology team working 8.30am to 8pm, this four hour turnaround wasn’t always possible, particularly because cultures were routinely dropped off in Blood Science and, if this happened out of hours, they’d be stored in an incubator until they could be analysed. This could result in the bacteria going through a growth cycle and lead to a potential misdiagnosis. Michael Collins is the Biomedical Science Team Manager, he said: “We knew that we needed to look at how to improve this so sat down with Dr Michael Weinbren, our Consultant Microbiologist, to discuss it and think about a plan. Eventually we decided to see how moving the Blood Culture analysers to Blood Sciences would change things and ask them to load cultures when they arrive. ​“Blood Sciences work 24/7 which means that cultures could always be loaded on time and our cultures are delivered to a central reception located within Blood Sciences. The cultures were already there so it made sense to see if they could also load them into the analyser. We had a number of meetings about it and Service Manager Chris Ainger and the Blood Sciences team were fantastic in helping us to take this forward. Sepsis remains undetected the risk of death increases by 7%..
​The change involved more than just analysing cultures because a prompt method of delivery needed to be devised to be able to facilitate this new system and this was provided through the already existing pod system. Richard Heathcote is a Specialist Biomedical Scientist who, alongside Michael Collins and Dr Weinbren, was instrumental in taking this forward, he said: “We looked at where we could speed up the process further and came to the conclusion that if we used plastic bottles within which to collect the cultures instead of glass then we could use the pod system. What tended to happen was that areas would group cultures together until they had enough to porter across to us. It’s a good ten minute round trip for someone to walk which, on a busy ward, isn’t a great use of their time. Now they come to us as soon as they’re ready almost instantaneously without any time consequence to ward staff. 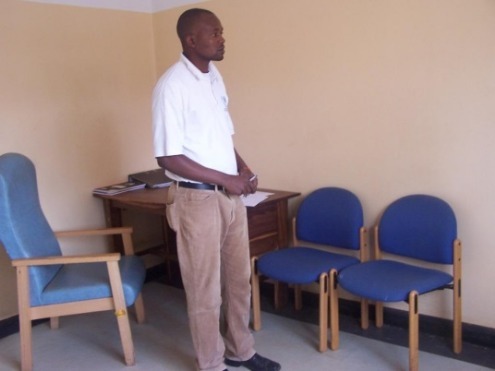 ​“When all the training was done, the bottles arrived and we had support staff engaged we just decided to go for it and it is now embedded across all biomedical science. We’re all aware of how important it is to get the cultures here on time, loaded into the analyser and processed. We get 96% of cultures within two hours and can load them at any time of day or night. We can now turn results around very quickly with 90% of cultures receiving a report within 24 hours compared to just 2% for your average teaching hospital. ​The Trust has received a lot of interest from other Trusts looking at how our model for blood cultures can be applied at their hospital. It was also the subject of a four page article in ‘The Biomedical Scientist’ magazine. ​Nightingale ward had a very special delivery on Tuesday 16th February when Joanne Hinkley and her son, Elliot, delivered £800 worth of Lego! The boxes came courtesy of national charity Fairybricks, set up by three friends through their mutual love of Lego with the aim of donating bricks and Lego sets to hospitals across the country. 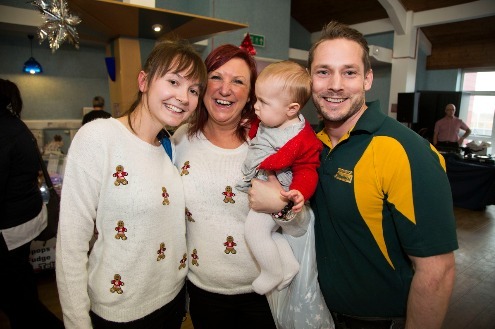 Elliot is a massive fan of the popular bricks and he and his Mum (pictured far right) had supported the charity a number of times at Lego events. This led to Fairybricks asking them about their local hospital (the Royal!) and donated the sets that you can see in the picture to the left. The sets include the popular Creator series allowing the children to make several different models following the instructions and using the same bricks, the Friends series, the endlessly popular City series and much more, including Duplo for the younger children. ​Jenny Reaney (pictured above, far left) is the Play Team Leader, she said: “We usually give the sets out to children who might be here over their birthday, perhaps for Christmas or if they’ve been in for a while and are in need of a treat. We do have some Lego in our playroom and will use some of the sets to top up the collection of bricks we already have. You can certainly never have too much Lego! 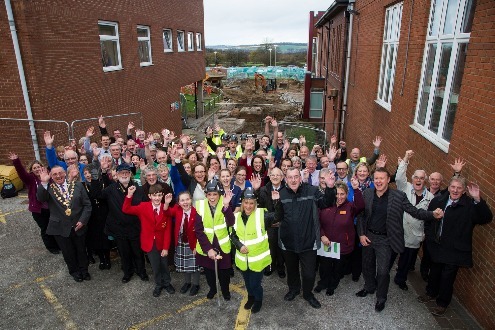 Preparatory building work started in late 2015 and is gathering pace with the £9million centre scheduled to open towards the end of 2016 alongside a £2.5million fundraising campaign with our partners, Macmillan Cancer Support. The centre will increase the number of chemotherapy chairs for patients from eight to 21 alongside two treatment beds and three treatment rooms. This is a significant increase and necessary to accommodate the 1,500 people across our region that are told that they have cancer each year. ​Tracy London is our Cavendish ward matron, she said: “We’ve known for a while that the unit is becoming overwhelmed in the sense that the number of patients we need to see is outweighing the capacity. It means that we are lacking the space to deliver the care we would like and , because a lot of the support services are located in different areas of the hospital it can be difficult to access that support as quickly as we would like. There were a number of patients at the turf cutting as well who were able to tell their stories, including James Colhoun who is a leukaemia patient and has experienced our services first hand. because a lot of the support services are located in different areas of the hospital it can be difficult to access that support as quickly as we would like. ​​projects, based on a design by The Manser Practice who were involved in the construction of our main entrance and birth centre. You can see the latest pictures of the build below. There have been many fundraising activities for Macmillan’s appeal, some of which you can see by clicking here. If you would like to know more about the appeal, including patient stories, some video clips on how you can help and why the centre is being built then you can visit Macmillan’s dedicated page by clicking here. It was a fantastic end to the year and there was plenty going on around the Christmas period to help everyone at the Trust, whether staff, patient or visitor, to help see in the New Year. For a full gallery of pictures please click here. It all started with an incredible donation of toys from Shirebrook gentleman Dennis Widdowson (pictured left) and his wife Mary, Every year they spend time buying toys, games and books, bringing them in for Christmas. They are then wrapped up and handed out to the youngsters on Christmas Eve and Christmas Day to give them a bit of festive cheer. The Trust also received a number of other donations from Mecca Bingo, Tesco, the ladies from Sainsburys came in to read a Christmas story about Mog the Cat and handed out more Christmas gifts. Youngster Paige Helliwell saved up her money and decorated two show boxes which she filled full of gifts such as glitter pens, dinosaurs, colouring books, gem stone stickers and lots more. An incredibly thoughtful and generous young lady! Of course there was the annual visit of the Chesterfield footballers who spent well over an hour talking to the youngsters, handing out goody bags, posing for photographs and signing autographs. Thank you very much to them and we wish the club a hugely successful 2016! For staff there was plenty to celebrate as well!!! There was a Christmas Fayre that featured a number of stalls selling gifts, cakes, stocking fillers and much more with the money raised going towards the Chesterfield Royal Macmillan Cancer Centre Appeal and the hospitals own charity. It also featured a performance by the Royal's celebrated Choir who also took time out to perform in the main entrance, outside in front of the Christmas Tree and to patients on our wards. There was a staff Christmas Tree competition, a number of quizzes and tombolas, a Christmas Dinner served by the execs (including a special sitting for our incredible volunteers) and plenty of other activities to help see out 2015 with the chance to have a little but of fun as well.